Instrumentation: Drums, percussion, bass, guitars (electric, acoustic), acoustic grand piano, Hammond B3, male lead vocal, harmony vocals). And what musicians these are too. All LA A-listers LA including Nathan East, Tim Pierce and Rami Jaffe, along with Simon Phillips whose studio it was initially recorded in and who one would have to 'blame' :) for there being over 20 tracks of drums alone! This being recorded in a drummer's studio--not to mention the drummer himself being one of the real masters of the art--this session is an absolute must if you want to study the recording of drums. The ASSR video (the Recording Drums and Live Tracking Session scenes) will totally complete the picture for you if you want to know exactly how these drum sounds and tracks were arrived at. Although the basic tracks were recorded at Simon's, overdubs were grown more organically as Alan visited Tim Piece and Rami Jaffee at their own personal studios in order to record guitars and additional keys (mainly the Hammond) respectively. 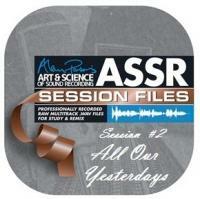 Again, you can reference the ASSR scenes on Recording Guitars and Recording Keyboards to see these sessions in detail. When it came to recording the lead vocal Alan went home to California and recorded the lead singer of the Alan Parsons Live Project, PJ Olsson, half way across the country from PJ's house in the midwest. Check out how this was achieved on the Internet Recording scene in ASSR. So we then come to the embarrassing part. Subsequent to the PJ 'remote recording' session Alan was persuaded by his mix engineer Coley Read to take a swing at the lead vocal himself. And so he did, to great effect, and you can hear results on the ASSR video and indeed on the version of this track that was released by Authentik Records. The embarrassing part? We simply cannot locate the drive where Alan's lead vocal was added to the multitrack. So, until we do (and please feel free to send in helpful suggestions, like "have you looked under the couch?" or "Well, I have it!" etc etc, you will have to be satisfied with PJ's nonetheless quite excellent 'original' lead vocal. Best choice Session File for working with / studying drums and big vocal harmonies.